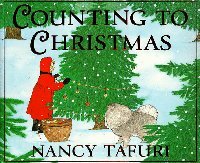 “Counting to Christmas” is a colorful and cheerful story of a child waiting for the big day to arrive. It covers numbers 1 to 25 (from December 1 to 25!). It also gives children ideas to keep them occupied while they are waiting. If you are tired of hearing “ when, when, when” this book is for you. Included in the back of the book are recipes for some of the activities. You can make cards, string popcorn , bake cookies and feed the birds. The main focus of the story is on giving to others , a nice change of pace when our society mostly focuses on the “gimmees” of the season. I recommend this story to be read to the 3 to 5 age group. Older children will be able to read it themselves. All children will love making the projects in the back of the book . You will have peace and quiet for a few minutes. And then you can all clean up the mess!